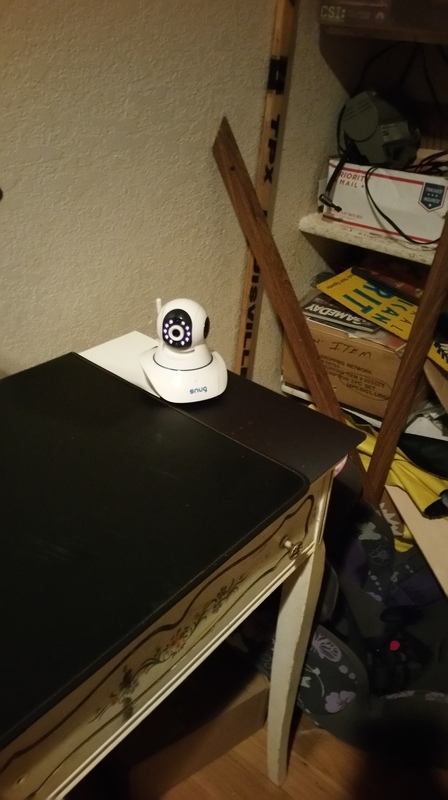 I was chosen to review this new type of baby security camera. You have many types of baby camera’s that you plug in the wall and connect to mulitple monitors but have to be the same brand. Also, these type of camera’s you can’t record or sometimes don’t have audio. This day and age everything is ran by tablets or smartphones. That is where this camera comes in, Set up is easy,as you have to have a direct connect to the router to the camera from what the instructions say, I have a wifi extender that has a gigabit port to make it straight to the lan line to connect to the camera. Once everything is set up you have to install on your smart phone with the QR scanner to install the software faster. The smartphones this is compatible with is a Apple device, ora Android device, If you click the link above you can see the camera at night, and it does give a option to talk into it, you can into it if you see the kids not doing something right, I have a 17 month old and 8 and 9 year old, right now we are using it in the den area where all my office supplies are so I can see if they are getting into something they are not to, The camera goes in a 306 degree circle with one touch of a button, or slide your finger side to side to go slowly in a circle. It also goes up and down in a complete circle the see anything suspicious. I like that it can record so I know when the kids come out of the room, as I have it pointed directly to the room. But take a look at the video and you can see everything cool about this. Compared to all the video baby monitors they have out there this has to be the best I have owned. Disclaimer I recieved this free in exchange for a honest unbiased review.